Say so long to spots, dullness, and unevenness, and hello to brighter, more even, and stress-free looking skin. 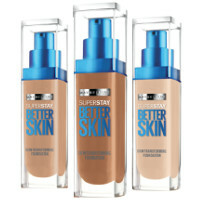 Superstay Better Skin® Foundation provides all day flawless coverage and improves skin over time. Great mascara - truly waterproof!